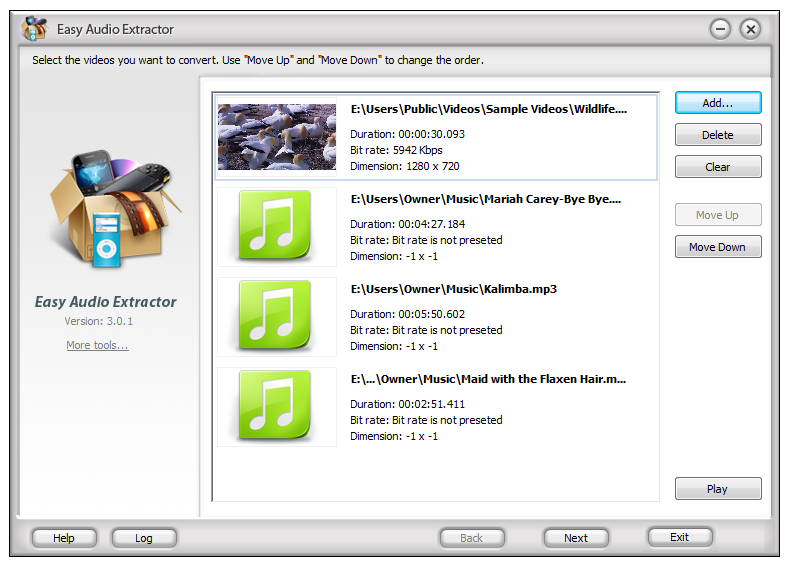 Easy Audio Extractor is a very easy wizard program to extract audio from video of various formats. It is the Pro version of Free Audio Extractor. It provides wizard mode & user-friendly operating window to guide the users, as it is a very easy and efficient way for all customers. It also provides various presets for precise output control. You can use batch file conversion to save time. Easy Audio Extractor can extract audio from video and save the extracted sound in WMA, MP3, WMA, OGG, AAC, M4A, FLAC and MP2 formats. Tons of video input formats are supported: HD Video (inc. Blu-ray video, AVCHD, MPEG-2 HD and WMV HD), AVI (DivX, Xvid, etc. ), DV AVI, MP4 (inc. Sony PtSP, Apple iPod and Archos), WMV, 3GP, 3G2, QuickTime (MOV, QT), DVD, VOB, VRO, MPEG-1, 2, 4, TOD, MOD, MPG, DAT, VCD, SVCD, Real Video (RM, RMVB), ASF, ASX, MJPEG, H.263, H.264, DVR-MS, MKV, OGM, FLV, AMV, MTV, TS, M2TS, M2T, MTS, DPG, NSV, FLI, FLC, CDG, etc.